and designed by Tim Hatley, and The Brontes with choreography by Gillian Lynne. With Robert Carsen, he wrote the script for the Euro- Disneyland Horse Opera Buffalo Bill’s Wild West Show which has been running twice a day, every day, ever since it opened in 1993, making it the longest running theatre spectacle in Paris. The music for this show, with forty horses, live buffalo and Native American Indians, is by the Oscar-winning composer George Fenton. He has collaborated with Robert Carsen on two other shows – the Châtelet production of Bernstein’s Candide (2004), where they completely re-wrote the “Book” (the production also toured to La Scala , Milan and the Bunka Keikan, Tokyo), and a one-woman show for Ute Lemper called Nomade (2003) also produced by the Chatelet Theatre. In 1997 he wrote the text for a dramatic cantata based on a Georgian Folk Story for the Dutch composer Eduard Alexander, called The Wedding of the Sun and the Moon. In 2005 he was commissioned by the Flemish Opera to write the libretto for Giorgio Battistelli’s opera Richard III. 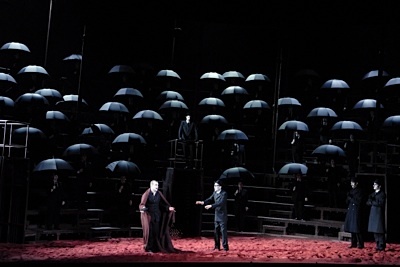 This opera, which is now almost a repertory piece, has been performed in Antwerp, Ghent, Dusseldorf, Duisberg, Geneva and Strasbourg and next year will be performed at the Grand Theatre, Geneve. At the beginning of 2011 it was voted by the American publication Opera News as the best new opera of the decade 2000-2010. In 2010 he was commissioned by the English National Opera and Punchdrunk Theatre to write a new libretto based on Webster’s The Duchess of Malfi for the opera by the young German composer Torsten Rasch. This was performed to great acclaim in a deserted office block at one of the last stops on the Dockside Railway by the river Thames. He has subsequently written the Book and Lyrics for a new Rock version by Michael Torke of Monteverdi’s Il Nerone, called Pop'pea, performed at the Chatelet Theatre, Paris, in May 2012, and also an original libretto for a new work by the distinguished young French composer Philippe Fenelon, called JJR, to celebrate the three hundredth anniversary of the birth of Jean-Jacques Rousseau, commissioned by the Grand Théâtre de Genève and performed there in September 2012. He has also written a song cycle based on Genet’s Condamne a Mort, and two opera libretti based on Shakespeare’s Titus Andronicus and Dostoyevsky’s White Nights for the young Strasbourg composer Boris Boulanger–Haas. His libretto for the new work by Georgio Battistelli, called CO2, an opera about climate change, premiere May 2015, La Scala Milan.